Acting NASA administrator Robert Lightfoot testified during a House Space Subcommittee hearing about the NASA budget for fiscal year 2019 on March 7, 2018, at the Rayburn House Office Building in Washington, D.C. While the Trump administration's budget proposal for fiscal year 2019 supports the long-term goal of sending humans to the moon and Mars, some members of Congress fear that the proposed shift for NASA's priorities could leave the agency's science missions in the dust. During a hearing on Capitol Hill today (March 7), several members of the House Space Subcommittee expressed concern over the budget proposal's request to cancel six upcoming missions from NASA's Astrophysics and Earth Science programs. "Not looking at this scientific-based prioritization and moving away from that can set a dangerous precedent," said Rep. Ami Bera, D-Calif. "We don't want to get into a situation where every four years, priorities are changing. That makes it very difficult for [NASA] to focus on some of these longer-term projects." Rep. Ed Perlmutter, D-Colo., who proclaimed his love for science fiction during his opening remarks, compared NASA to the film "Back to the Future" and even quoted Yoda from the "Star Wars" films while making a similar argument. "Some of what we're doing here reminds me of 'Back to the Future' — a real effort on exploration [and] a real desire to do that," he said. "I want to get our astronauts to Mars by 2033," he added, holding up a bumper sticker in support of his cause. "Do or do not. There is no try." During a House Space Subcommittee meeting on March 7, 2018, Rep. Ed Perlmutter, D-Colo., said he wants to see astronauts go to Mars by 2033. Despite his excitement about human exploration, Perlmutter agreed that a human mission to Mars should not hamper NASA's science activities. "There is an emphasis on exploration," he said, "but it seems to be at the expense of a lot of the other missions of NASA." 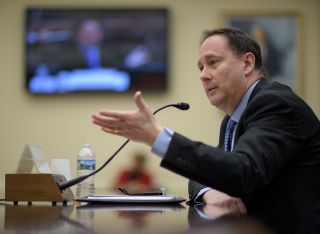 NASA Acting Administrator Robert Lightfoot, the only witness at the hearing, disagreed. "We've aligned that technology budget with the exploration initiatives, and that particular part of the budget will now focus on what we call our 'long poles' to getting to Mars — things like in-space propulsion, radiation safety, advanced life support that we need to actually take crews to Mars … so I think we still have a very balanced portfolio going forward." As for WFIRST, Lightfoot noted that other future missions could make up for the missing data. For now, NASA will have to count on the James Webb Space Telescope and the Transiting Exoplanet Survey Satellite to fulfill the agency's astrophysics needs. "None of us is going to argue that exploration is not important," Bera said, "but we also want to make sure we don't lose sight of the space science side, the space technology, the aeronautics and education."